Stone Soup for Five: Doodle Wednesday! Simple Fonts to try! Doodle Wednesday! Simple Fonts to try! 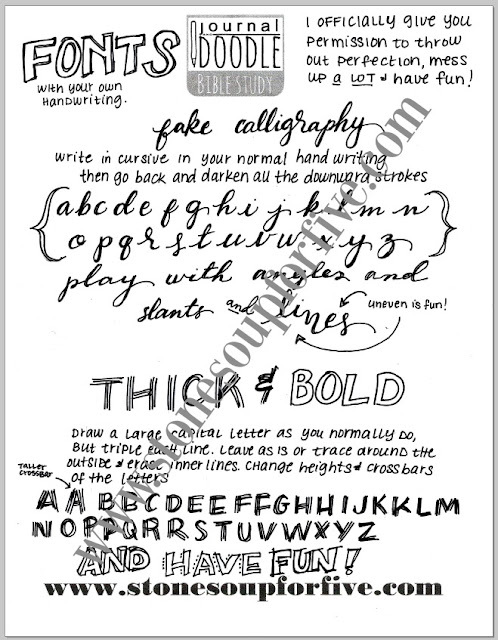 This week I wanted to give you two different fonts to try using your own handwriting. Nothing difficult, but big results to play around with! Have fun and be sure to use #journalanddoodle if you're sharing on social media! I'd love to see! These are the BEST! I am going to add these to my Creative Notebook. I love all the ideas. It helps me get my creative juices flowing. Thank you so much. Your generous spirit is a blessing to so many. Keep up the amazing work.